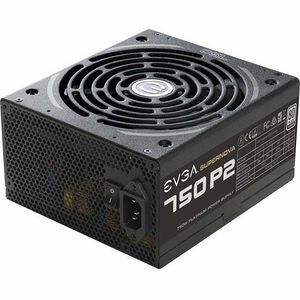 The unbeatable performance of the EVGA SuperNOVA P2 power supply line is now available in 850, 750 and 650 watt versions. Based on the award winning P2 power supplies. these units feature 80 Plus Platinum rated efficiency, and clean. continuous power to every component. The ECO Control Fan system offers fan modes to provide absolutely zero fan noise during low to medium load operations. Backed by an award winning 10 year warranty. and 100% Japanese capacitor design, the E VGA SuperNO VA 850, 750 and 650 P2 power supplies offer unbeatable performance at an unbeatable value.